A Thin, Colorful, Well Made Gary Point That Displays Visible Aging And Ancient Use Wear, Age Stained Hinge Fractures, Consistent Stone Surface Aging Patination, Aged Surface Deposits, Correct Blade Sharpening Use Reduction, Correct Woodland Style Blade Flaking, Correct Basal Style And Overall Shape, Correct Material And Manufacture For The Area Found. 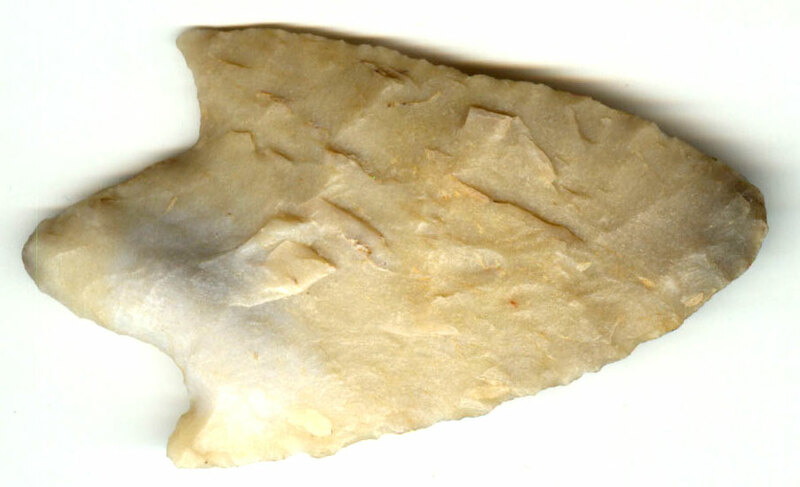 Gary Points Are Found In Many Shapes Distinguished By A Pointed Stem And Thinner Than Similar Adena Points. Ex-Sam Johnson Collection. This Is An Excellent Example, Made Of A Nice Local Material Used To For Sharpening Stones. Includes A Ken Partain Certificate Of Authenticity.